The Spring 2018 issue of the Ohio Archivist is now available! In this issue you will find all the information about the spring annual meeting, including details on the Thursday evening mixer and the preconference workshop. The issue also contains grant and award information; news from SOA members and institutions across the state; a recap of the joint OLHA/SOA fall meeting; and statements from the the SOA slate of candidates that will be voted on during the annual meeting. Special 50th anniversary content includes more statements from SOA past presidents by Feature Editor George Bain. This entry was posted in Newsletter, Publications, SOA Spring Conference on April 23, 2018 by Andrew Harris. The Ohio State University Libraries has completed digitizing and archived the Ohio Archivist in the University’s Knowledge Bank. The Knowledge Bank (http://kb.osu.edu) is Ohio State’s institutional repository. Inclusion in the Knowledge Bank means that issues of the Ohio Archivist will be searchable (e.g. by Google) and available via the Internet. Other benefits of this arrangement include long-term preservation in a professionally managed repository, a worldwide audience, a long-term stable URL that can be used in citation, and an increased web presence. 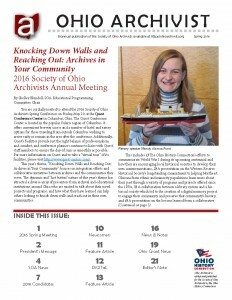 The Ohio Archivist is the official newsletter of the Society of Ohio Archivists (SOA). Its primary mission is to serve as a conduit for information about the SOA and its membership. The Ohio Archivist also publishes articles containing general information about the archival profession, especially as it relates to archivists located within Ohio and the Midwest. The Ohio Archivist is published twice a year, in the spring and fall. This entry was posted in News, Newsletter, Publications on March 20, 2018 by Andrew Harris. We are pleased to announce that The Ohio State University Libraries will archive digital versions of the Ohio Archivist through the University’s Knowledge Bank. The Knowledge Bank (http://kb.osu.edu) is Ohio State’s institutional repository. Inclusion in the Knowledge Bank means that issues of the Ohio Archivist will be searchable (e.g. by Google) and available via the Internet. Other benefits of this arrangement include long-term preservation in a professionally managed repository, a worldwide audience, a long-term stable URL that can be used in citation, and an increased web presence. We welcome questions from any author/contributor to the Ohio Archivist regarding inclusion in the Knowledge Bank. Please contact us at rheise@co.greene.oh.us. This entry was posted in News, Newsletter, Publications on February 1, 2018 by Andrew Harris. The Ohio Archivist, Fall 2017 issue is now available. Our three feature pieces this fall deal with a local music history project at the Rock and Roll Hall of Fame Library and Archives; House Bill 139 and the accessibility of adoption, and lunacy, records; and as part of the SOA’s 50th Anniversary, a “look back” by several past-presidents of the organization. In addition you will find all of the usual favorites: write-ups on the annual meeting and the upcoming joint OLHA/SOA meeting in October; Dan Noonan’s DiGITaL piece on finding a balance in how much metadata archivists create; the “Newcomers” article in which Tanya Maus, Ph.D, describes two student led projects at the Peace Resource Center at Wilmington College plus all the news and notes from members and member institutions across the state. 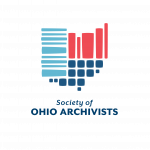 Finally, due to the SOA’s brand new logo, the Ohio Archivist underwent a redesign which we know you will like. We thank Kim Koloski our design editor at the Ohio History Connection for her exceptional work and creativity. Enjoy! And thank you all so much for your continued readership. This entry was posted in Newsletter, Publications on September 13, 2017 by Andrew Harris. Read the Ohio Archivist Spring 2017 issue! In it you will find your usual seasonal announcement for our annual meeting and also a recap of our fall meeting. Be sure to pay close attention to your 2017 list of SOA leadership candidates and read their personal statements. As well, you will find committee announcements; grant and award information; news from SOA members and member institutions from around the state; and also some great articles on data migration by Dan Noonan in DiGITaL Section and another consisting of first-person accounts on mentorships, edited by Stephanie Bricking in Newcomers. Enjoy! For PDFs of past issues visit the Newsletter page. This entry was posted in News, Newsletter, Publications on April 26, 2017 by Andrew Harris. The Fall 2016 Ohio Archivist is now available. Although it wasn’t the initial plan, this issue in many ways focuses on student archivists and new professionals. Feature articles by Madeleine Fix and Kelly Francis-Love discuss a student capstone project and an internship respectively. In Newcomers, Christine Schmid Engels “rethinks” the role of interns and volunteers. Also in this issue, Dan Noonan’s DiGITaL article sheds light on the ten year history of the SAA Research Forum. In addition, you’ll read about the goings-on of SOA members and member institutions, Ohio grant information, and as usual, a recap of our annual meeting and the announcement for the coming fall meeting. Check it out here or here! This entry was posted in Newsletter on September 7, 2016 by Andrew Harris. The Ohio Archivist Spring 2016 edition is now available for download on the SOA’s website and at issu.com. The Spring issue debuts an exciting new design format thanks to our friends at the Ohio History Connection and as usual contains many interesting pieces. 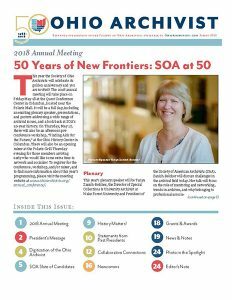 Look for SOA’s Annual Meeting announcement, a recap of the Fall meeting, candidates’ statements for the upcoming SOA elections, feature articles on the National Coalition for History and OhioDIG, a Newcomers article, Daniel Noonan’s DiGITaL column, archives news from around the state, and much more. This entry was posted in Newsletter on April 15, 2016 by soa. The Fall 2015 issue of the SOA’s newsletter, The Ohio Archivist is now available for download on the SOA’s website and at Issuu.com. In it find reviews of the 2015 Annual Meeting, a description of the upcoming Fall Meeting, SOA elections, archives news from around the state, and great pieces on internships, post-custodial theory, and the SOA’s Cuba Project of the 1990s. This entry was posted in Newsletter on September 29, 2015 by Andrew Harris. In it there are some great pieces on encryption, handling hazardous materials in archival collections, and of course all the news from around the state. Also, be sure to check out the brand new recurring article called “Newcomers” edited by Stephanie Bricking which deals specifically with students and young professionals. This entry was posted in Newsletter on May 6, 2015 by Andrew Harris. The Fall 2014 issue of the Society’s newsletter, the Ohio Archivist, is now available for download from this site and issuu. Articles and news items include: “‘History’s First Draft’ Online: NDNP in Ohio” by Jenni Salamon, “What is Your Personal Digital ‘Ecosystem’?” by Daniel Noonan, News & Notes, Ohio Grant News, Annual Meeting Summary, Archives Month, Fall Meeting, Merit Awards, National History Day in Ohio Awards, and the New Professional and Student Conference Scholarship Award essays. This entry was posted in Newsletter on September 16, 2014 by Janet Carleton.